Pronounced re-soup-i-nation, it has nothing to do with getting a second serving of soup at Smorgy’s! Resupination is the process by which the flowers of many orchids, as they open, twist so that the lip is orientated below the other floral segments. All of the commonly grown genera (Cymbidium, Dendrobium, Phalaenopsis etc.) have resupinate flowers. Twisting is due to rotation of both the ovary and pedicel. One of many interesting features of resupination is that the flowers only undergo resupination if it is necessary to orientate themselves so that their lips are lowermost. 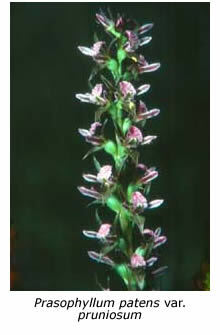 Thus the flowers on the ascending part of an arching inflorescence undergo resupination, while those on the descending part do not. Another curious feature is that, as a general rule, the direction of resupination alternates from flower to flower up the inflorescence. For example, if the first flower on the inflorescence twists in a clockwise direction during resupination, then the second one twists in an anti-clockwise direction and so on! Resupination begins to occur as the buds open and is essentially complete by the time the floral segments are fully expanded. 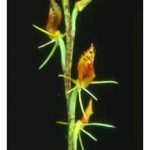 Why are most orchid flowers resupinate? The main theory is that resupination orientates the lip to provide the orchid’s pollinator with a convenient landing pad. This theory sounds reasonable, although the American glossy bee Euglossa cordata is known to pollinate the flowers of several different catasetum species whether their flowers are resupinate or not. Most resupinate orchid flowers twist through 180 degrees as they open but the flowers of Angraecum superbum rotate through 360 degrees, so that they eventually reach the same orientation as if they were non-resupinate! 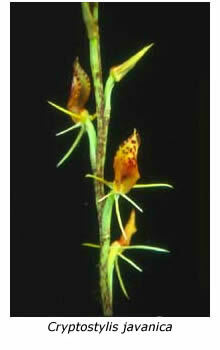 Orchids with non-resupinate flowers (their lips are uppermost) include Osmoglossum pulchellum, all species of the Australian terrestrial genus Prasophyllum and some Satyrium species. 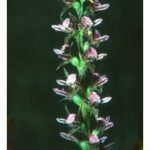 From an aesthetic viewpoint, resupination is important to orchid growers. Nothing looks more ridiculous than an arching cymbidium spike that has been staked upright after the flowers have opened. All the flowers face upwards, with their lips uppermost. By all means, stake such an inflorescence upright for transport but on arrival release the ties so that the flowers are displayed in their customary manner. Source : Resupination by J. & M. Arditti, R. Ernst and L.P. Lyman, Proc. 12th. World Orchid Conference, Japan, 1987.